MORE THAN HALF A CENTURY OF RACING EXCELLENCE! 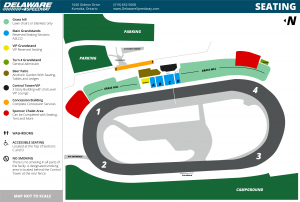 Delaware Speedway is a half-mile paved oval stock-car track, located just west of London, Ontario, Canada. For more than 60 years, Delaware Speedway has been the home to some of the finest stock car racing in Canada. Its unique natural amphitheatre-like setting allows a family or group of friends to enjoy an exciting, comfortable and affordable evening or afternoon of entertainment. Delaware Speedway is one of Canada’s premiere racing venues. The half-mile paved short track plays host to some of the best weekly racing around as well as some of the top touring series. Take a look at our track map to learn about the venue and pick your favourite spot before you even arrive! Check our ONLINE SCHEDULE to pick a date and join us at the track! Tickets can be purchased through our secure online ticket system, purchased at the admission gate the day of the event, or charged by phone by calling (519) 652-5068 Ext 201. All this information can be found on our TICKETS PAGE. Season’s Passes are also available for up to 35% off admission prices! Delaware Speedway easy to find. The track is located minutes from London, Ontario and is also easily accessible through the town of Delaware by highway 402 or from London via Oxford Street. Check our DIRECTIONS PAGE for more information. How will I know what’s going on? The speedway announcers will help keep you in the loop, also be sure to pick up one of our FREE weekly printed programs and roster pages to help pick out your favorite driver. What should I bring? Some things that might make your stay more enjoyable – binoculars, sunglasses, baseball hat, portable radio (89.1 FM is the track radio feed). On sunny afternoons be sure to bring some sunscreen. For cooler summer nights bring a sweater. I have a question about… Over the last 60+ years we’ve heard just about any question you can think of! For answers to questions about pets, outside food, smoking, rain policy and more please check our FAQ PAGE. If the answer you’re looking for can’t be found please contact us at the speedway office by e-mail (info@delawarespeedway.com) or telephone (519) 652-5068.